This recipe is simple, easy, and absolutely lovely! Your friends and family will be delighted to unwrap them this holiday season! Measure beeswax into a glass Pyrex measuring cup. Place the measuring cup in a small saucepan filled with water on medium heat. Melt the beeswax, then add in coconut oil and sunflower seed oil. Once liquefied, remove from heat and allow to cool slightly. Add in biodegradable glitter and stir well. Continue stirring until the mixture begins to thicken. Allow to cool for 10-20 minutes. 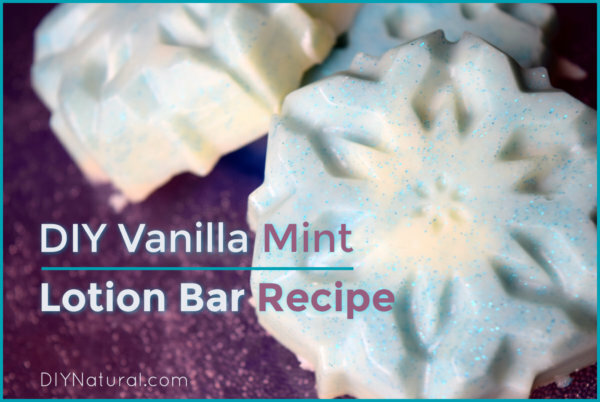 Store these vanilla mint lotion bars in a cool, dry place. To use, simply rub directly on dry skin. Your body heat will melt the bars on contact. I like to put mine in glass jars for gifting, though you can certainly gift them in any container you like.